Although, if we go with a recent study conducted by Smart Insights, since 2012, we have witnessed some exponential improvements in the organizations who have adopted digital marketing in their process, however, still the numbers are not satisfactory as they donâ€™t have any defined strategy. 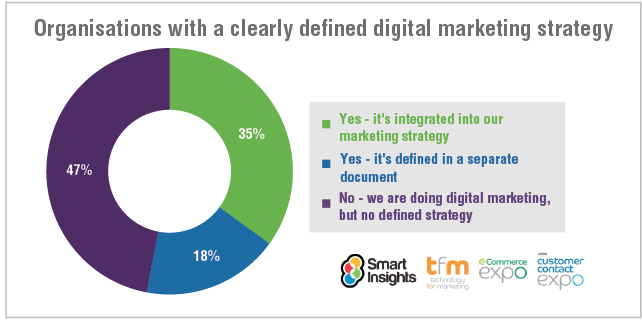 You can also see the result of this survey showing what percentage of the organizations has clearly defined digital marketing strategy. The above results clearly show that still, we have to go a long way long way as more than half of the organizations are running without a sound digital marketing strategy. 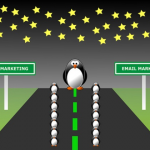 Some organizations claimed that they are receiving loads of traffic on a daily basis, but the fact is that it means nothing unless this traffic converts into leads or sales. 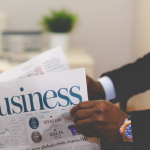 Our this blog post is primarily dedicated to those business people, who havenâ€™t yet gone digital in their marketing strategies and following the traditional ones. If you donâ€™t have any strategy, we have set out 7 reasons, why you need digital marketing strategy in this technology prone environment. As mentioned earlier, for the past few years (Especially after 2009), technology has completely transformed around the globe in all spheres. At every regular interval, we witness with innovation in technologies. You could already see the revolutions brought by smartphones. So, what I mean to say is that digital marketing has now become a trend for the marketers. This is the most efficient ways to reach your target audience in quickest time. Here the chances of growth are, more than the traditional strategies due to revolution brought by social media. In this fast paced technological environment, everyone is going digital and wants to be in front of a maximum number of people to sell their products. There is no doubt that you should have a digital marketing strategy to meet today’s trend. Yes! Digital Marketing is currently heartbeat of marketers as it is not only a fastest growing force in the current marketing scenario but it is all set to the future of marketing world. Do you aware of the fact that, one of the biggest advantages of digital marketing is, you can easily track and monitor the reach and the results of your inputs. You can easily view probable customers response rates and measure the success of your targeted marketing campaigns. As conversion optimization is the primary motive behind the inclusion of digital marketing strategy. The primary focus of marketers is to use Search Engine Optimization, Social Media Marketing, and Email Marketing as tool and techniques as their tool and techniques for a digital marketing campaign. The above three techniques of digital marketing are quickest and effective mode of interacting with the target audience and giving more than average results in terms of conversion rates. Apart from this, Digital Marketing assists small and medium organizations a chance to compete with the already established organization as they have enough resources to perform their marketing process. That why, I called it a heartbeat! Small scale businesses or the ventures, which operates with low cost of capital and operations, have very fewer resources to invest. 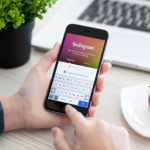 They canâ€™t bear a massive operating cost of traditional mediums of promotion. Therefore, Digital Marketing is simply the best and much more cost effective promotional medium for giving maximum optimized results. You can better understand with a below-mentioned example. 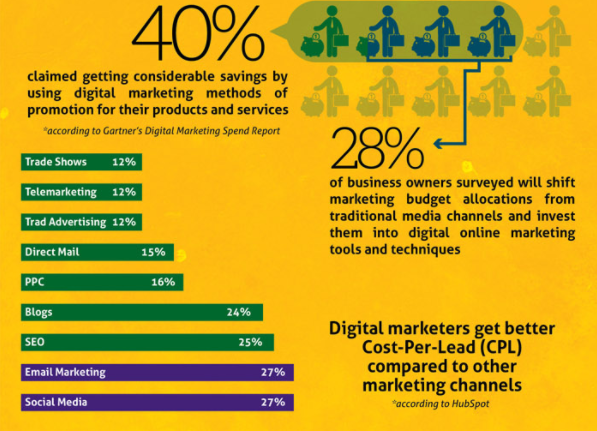 As you see in the above stats gathered by Gartnerâ€™s Digital Marketing and Hubspot, around 40% marketers are claiming to get handsome savings by using digital marketing methods in their promotion. 28 % of business owners are planning to shift their marketing budget from traditional mediums to digital marketing techniques. The result of this transformation is that Digital Marketers receives much better cost-per-lead compared to other marketing channels. Traditional Marketing related to those marketing strategies used before the coming of the internet. It includes so many marketing tactics such as direct sales, radio, TV, mail, print advertising and printed materials like brochures or catalogs. Although, traditional marketing could be effective in this fast paced technological environment, here come so many drawbacks than advantages. First of all, traditional marketing strategies are very expensive that not all the marketers able to afford them for a longer period. 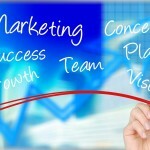 Your marketing budget will surely shoot up with these methods. Secondly, with traditional marketing, it’s hard to track results. For example, you do not know how many people see your billboard advertisement or how many exact numbers of the audience watch your TV ads. Most importantly, traditional marketing is like one-way messaging where marketers usually force customers to go for their products. Most of the audience do not fond of reading mailboxes fully loaded with spams. Digital Marketing has converted all the cons of traditional media into pros and make easier for the customers to choose best among many. This is one of the most important reasons why you need a robust digital marketing strategy in 2017. Remarketing is that particular ad based targeted marketing, in which businesses revisit previously visited user’s, who, although came to your website but do not make any purchases or any action. This is one of the powerful insights of the digital marketing strategies. It allows the marketers the opportunities to continue the communications with the customers. It results in conversions; even conversions are comparatively more in remarketing than the first time reach out. If you ask me what the key to get success in marketing is, I would say if you can generate a slow but steady flow of targeted audience in the form of traffic, it helps in converting prospects into leads. When you get your leads, it will convert into sale and sale into profits. The more your business generate this level of traffic, you will see changes in your ROI. This is what you get from Digital Marketing strategy. It is scalable, and brand can reach to higher and maximum possible audience depending upon their budget. Obviously, when you deliver what you have promised to your customers, it creates a better relationship between you and your target audiences. These loyal customers, then become your brand ambassadors and spread a good word of mouth across different corners. Your brand identity entirely depends on how to sound your relationships with the customers and it is the reason behind your reputation in the market. Digital Marketing, with the help of â€˜â€™Internet of Thingsâ€, makes an interconnected global ecosystem of various devices like smartphones, tablets and other gadgets, which assist you to connect each other through the internet. So, now I can say that you are aware of how Digital Marketing is important to your business and it can do wonders also if implemented according to the nature of your business. At the end of the day, you have to increase revenues, which are your prime motive, and Digital Marketing strategy is that strong launching pad, that can push you towards the world of glory.